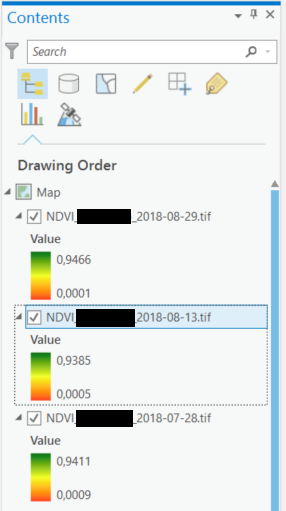 I have multiple rasters that represent the same thing (NDVI) at different times. Each of the rasters has a different range of values. I want to symbolise them using the same range of values (e.g. from 0 to 1) so that they can be compared. What is the best way of doing this? This question has been answered for ArcGIS. However, the procedure is different for ArcGIS Pro as the options have been removed / changed. The procedure on Pro is slightly different. This is how I have found is the best way to do it, however, if there is a better way, please feel free to answer. Change the Min and Max values in the appropriate boxes that are now ungreyed below. This does change the symbology, however it does not change the actual values. You will need to change the labels for the symbology to reflect the same values as your chosen min and max. This needs to be done for every layer individually. Not the answer you're looking for? Browse other questions tagged raster symbology arcgis-pro or ask your own question. How to use consistent symbology between multiple stretched rasters in ArcMap? Any way to use the range slider in ArcGIS Pro with a floating point raster? Attaining Consistent Symbology using Buffered Gradient in ArcGIS Pro?